(This picture, which I think is great, is from the site SaveTheAssistants.com. If you're an assistant, you'll love it). Saturday night was the beginning of Passover (פסח), the holiday celebrating the Jewish departure from Egypt under the direction of Moses. In terms of the solidification of the Jewish people, this event and the following 40 years spent in the desert was the real beginning of the Nation of Israel. We were the Jewish people before we left Egypt and that period of slavery, but with our exit we showed G-d our true faith, we accepted the Torah at Mt. Sinai, and eventually we entered the Land of Israel in order to claim our homeland. The Passover holiday is a celebration of the birth of our nation and religion. So how do we celebrate it in Israel? 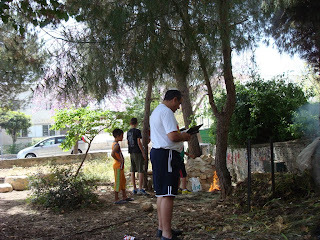 We set fire to parks in order to burn our chametz, or any leavened bread product. The custom is to clean your apartment like it is infected with mold, every inch of it in order to rid it of any chametz, and then finally you perform what is called bedikat chametz - literally checking of chametz. After you get a symbolic amount of this forbidden food together, a ritual you perform at night, the next morning you have to burn it completely. Everyone does this at the same time. Hence the fires. This picture isn't even half representative of how large this flame got. As we were burning the goods, about five different guys came by with their chametz and asked, angrily, "Why did you make this fire right here? It's too big." You know who started the fire? The city cleaning worker that left it unattended as he made his way around our street. Honestly, I think you'd get sued if you did that in America. Here, he was just being a good, although slightly irresponsible, Jewish citizen - providing a useful service for the masses. 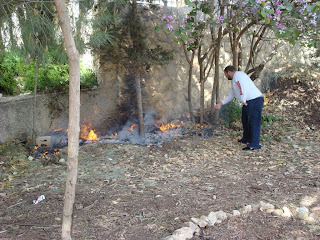 This guy here is performing bitul chametz, saying the prayer after burning the chametz. I had never heard of that practice.. burning chametz.. until I read this. I knew about gathering it.. here u can give to a non jew.. or "sell" it and buy it back after passover.. hmm that was very interesting.. they would not let you burn it here. In a year in which the world food crisis is getting worse Israeli citizens should go back to Seized Jerusalem (before 1967) habits, and all times Jewish sparing customs. 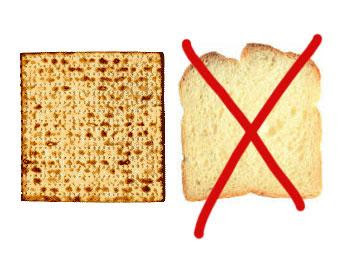 According to historical and practical common sense, during the weeks before Passover all efficient Jewish households try to consume most of the chametz they own and buy as less as strictly required fresh chametz. Then, you've only left to burn some symbolic crumbs and leftovers. I get really tired of you preaching people that won't leave a name or website so we can have a conversation over on YOUR take of the world. Should we go back to 1966? I think not. Let's not even discuss that here, however, since it has NOTHING to do with the matter at hand -- bedikat chametz. After you get a symbolic amount of this forbidden food together, a ritual you perform at night, the next morning you have to burn it completely. Don't speak English or just raring for a fight? Symbolic means "significant purely in terms of what is being represented or implied," according to Oxford. You know what that means? It means that a tiny amount of chametz, a symbolic amount, is burned. 10 bread crumbs. I see you said "that's how it is done in my home," so if you're a religious Jew why would you assume that we're over here burning loaves of bread or something dumb like that? Israel needs all the bread it can get. You think we're bathing in liquid gold or something? Go and sit on your pedestal while your Jewish brethren, if you are Jewish, are suffering over here -- your criticisms don't help us one bit.